Cisco 809 Industrial Integrated Services Routers, one of Cisco’s 15 new IoT products, is for remote deployment in various industries. DMVPN, QoS for cellular, Multi-VRF for cellular, Voice over LTE, all these words are used described the new Cisco IR809. Cisco 809 Industrial Integrated Services Router, the Cisco’s smallest multimode 3G and 4G LTE wireless router, is making it an ideal solution for distribution automation and remote asset management across multiple industrial verticals. 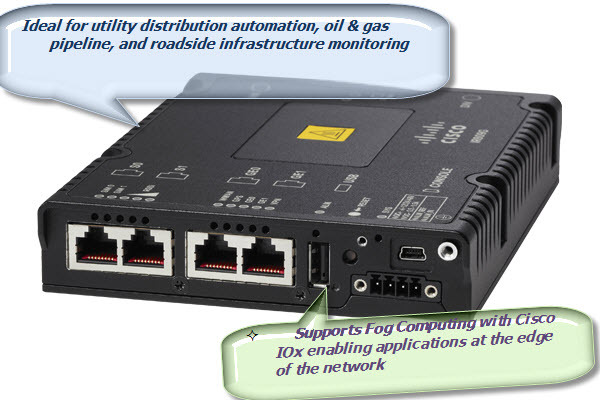 The IR809 brings together enterprise-grade wireline-like services, such as quality of service (QoS), Cisco Dynamic Multipoint VPN (DMVPN), and Multi-VRF for cellular, highly secure data, voice, and video communications and Cisco IOx, an open, extensible environment for hosting applications at the network edge. The 809 has an integrated 9.6-60 VDC power input and is designed to withstand hostile environments, including shock, vibration, dust, and humidity, and supports a wide temperature range (-40°C to +60°C and type-tested at +85°C for 16 hours). 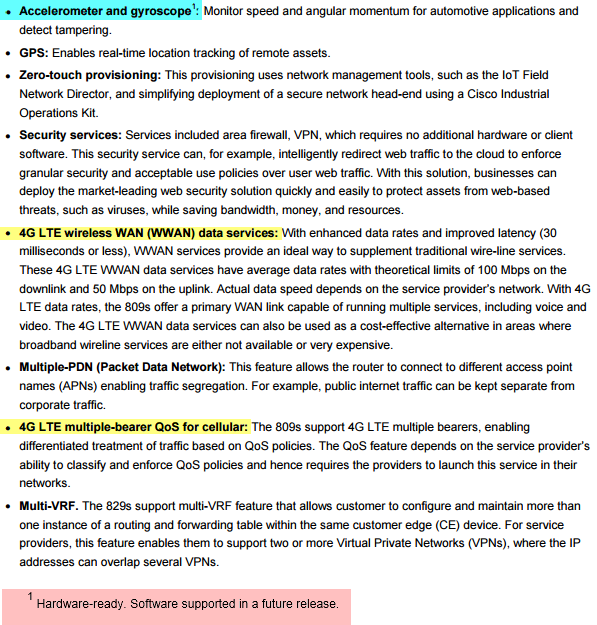 The Cisco 809 Industrial Integrated Services Routers support the latest 3rd Generation Partnership Project (3GPP) Release 9 Category 3 LTE standards. They provide persistent, reliable LTE connectivity transparent handoffs between LTE and 3G networks. IR809G-LTE-NA-K9: Multimode Cisco LTE 2.0 for carriers operating in LTE 700 MHz (band 17), 1900 MHz (band 2 PCS), or 1700/2100 MHz (band 4 AWS) frequencies; backward-compatible with UMTS and HSPA+: 850 MHz (band 5), 900 MHz (band 8), 1900 MHz (band 2 PCS), and 1700/2100 MHz (band 4 AWS). IR809G-LTE-VZ-K9: Multimode Cisco LTE 2.0 for carriers operating in LTE 700 MHz (band 13), 1700/2100 MHz (band 4 AWS), or 1900 MHz (band 25 extended PCS) frequencies; backward-compatible with EVDO Rev A/CDMA 1x BC0, BC1, BC10. IR809G-LTE-GA-K9: Multimode Cisco LTE 2.0 for carriers operating in LTE 800 MHz (band 20), 900 MHz (band 8), 1800 MHz (band 3), 2100 MHz (band 1), or 2600 MHz (band 7) frequencies; backward-compatible with UMTS and HSPA+: 850 MHz (band 5), 900 MHz (band 8), 1900 MHz (band 2), and 2100 MHz (band 1).